This party concept is for you, party animals! Pay 75 lei (about EUR 17) if you are a boy or 40 lei (some EUR 9) if you are a girl and pour it in: beers, long-drinks, shots! 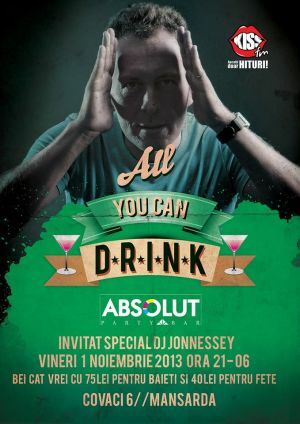 "ALL YOU CAN DRINK PARTY" Party in Bucharest. You can get here description, reviews, address, time and details of "ALL YOU CAN DRINK PARTY" Party in Bucharest. Visit Bucharest Tips for more Party events in Bucharest!